A simple, yet effective way to reduce your plastic footprint is to stop using the clear plastic produce bags you put your fruit and veggies into when you grocery shop and switch to reusable produce options. This small step can make a massive difference to your plastic reduction. Eco produce bags are an inexpensive and great environmental alternative to the clear plastic bags that are almost always used once and then thrown away since they are difficult to recycle. 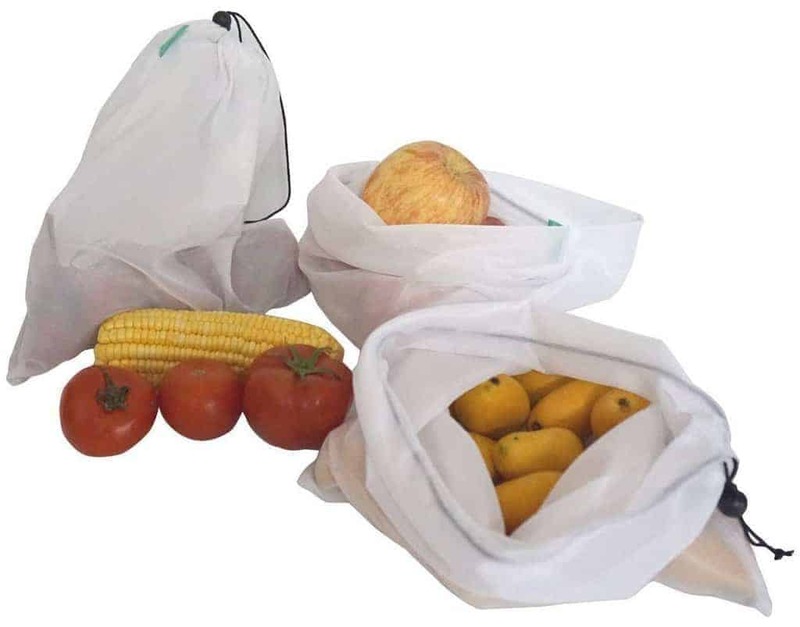 We have come up with a list of some of the best options for reusable produce bags that are easy to use, easy to clean and are very durable. Purifyou Premium Reusable Mesh Produce Bags are one of the most popular mesh produce options going these days. 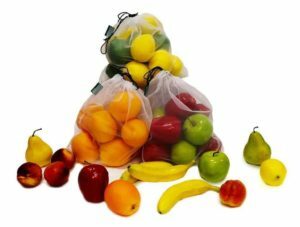 They work great for both replacing plastic options that you put fruit and veg in at the store and also using them to store your fruit and veg so they last longer. They couldn’t be easier to clean, just throw them in your washing machine and then air dry. They come in a variety of sizes that is a little more extensive than some brands. With this set, you get nine mesh bags, that includes two small 12×8 inches, five medium/large 12×14 inches, and two extra large that are 12×17 inches. The mesh material helps to maintain the right amount of moisture for your produce, so everything tends to last longer. They have tare tags to help ensure you only play for what you are buying and not the weight of the bag, although they don’t weight much at all. The material is BPA, lead, and mercury free, and Purifyou offers a lifetime warranty if you run into any issues. What is also worth noting about the Purifyou brand is that they donate a portion of each sale to charities that promote sustainable living. Earthwise also has good quality, inexpensive bags that work well when purchasing produce at the grocery store. This brand is one of the best options if you want a design that is easy to see what is inside. 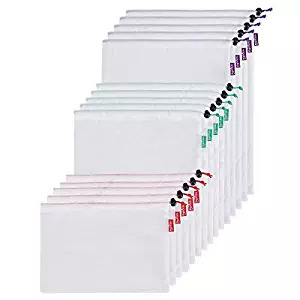 They are very lightweight, allowing them to be a little less opaque than some of the other brands, so it is easy for a cashier to see what is inside without having to open it. They are so thin that barcodes are scannable through the mesh. The Earthwise bags are all the same size of 11″ X 13.5″, and the sizing makes them perfect for all kind of produce. They don’t have tare labels, but they weigh less than 1/3 of an ounce so that you won’t be paying for much extra weight. They come with a durable drawstring for closing securely, and they are machine washable. These are the ones that I have been using for the last year or so, and I think they are fantastic. They are a little opaque, so they aren’t the easiest to see through if the cashier is looking for the code, but I usually leave the top open when going through the checkout. The cashier never seems to have any trouble seeing what’s in the bag and finding the code if he or she needs to. I like the little colored tags, but don’t stick with any system when using them. I guess a more organized person would put the same type of fruit and veg in each bag based on color, but I’m more willy nilly about what goes where. The bags are all the same size of 12 by 14 inches. My only issue has been I could probably use at least one slightly larger option because I buy an unusually large about of Swiss chard that ends up hanging out of the opening (same problem with celery). Not a big deal, but I will probably order some extra large sizes from a different brand to compare. They are very sturdy, yet only weighs .4 ounces and are made with 100% polyester. This 15 pack from Bekith are fantastic due to the variety of sizes and number of bags that you get for an affordable price. This set comes with five large, five medium and five small design, so you can use them for storing all kinds of things. Like most of the other popular options, they are made from polyester mesh. They are easy to wash and have color-coded tags, so you know what size you are using. These Bekith bags can hold up to 11 pounds, so they are pretty strong and are great for more substantial items like potatoes. They have a drawstring and pop lock, so they are easy to open, and you can close them securely ensuring nothing slips out. Generally, most people aren’t going to need 15 bags for each time they shop, but if you use two cars or have multiple people in one family who do the grocery shopping, this is an excellent set that you can divide up and you will always have them available. You can use them for plenty of other things since the sizing and amount you get to make them very versatile. If you would prefer not to use the polyester mesh material, you can get different fabrics including these Simple Ecology Organic Cotton Muslin bags. They come as a set of 6 (two large, two medium and two small). These are great, not only because you can use them for all kinds of produce, but you can also use them for grains and flour which you are unable to do with the mesh options. Many people also like these for storing food to keep it fresher longer. You can even dampen these the muslin and the store leafy greens keeping them from drying up, as opposed to the mesh products that are not recommended for storing leafy greens. If anything starts to wilt, just run the whole bag under water, or rinse the greens inside and stick it back in the fridge. 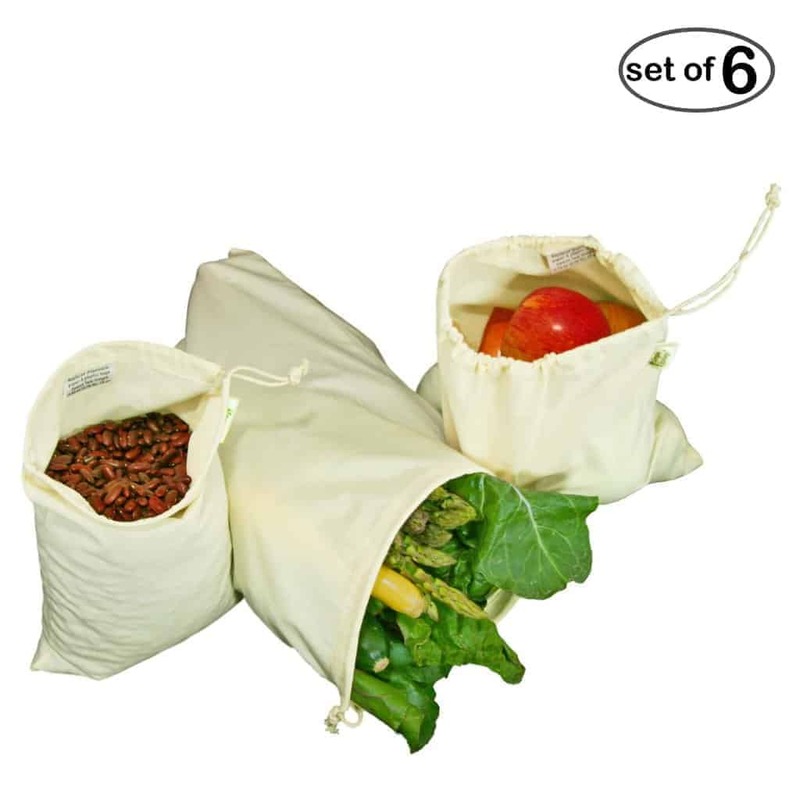 These Simple Ecology bags are well constructed and list the tare weight prominently, so they are easy to use. This option from Naturally Conscious have a little bit of a different mesh than some of the brands we listed above. They are made of nylon mesh that isn’t quite as tightly woven as some of the polyester mesh styles, allowing the product to be reasonably transparent. They fold up tightly, so they are easy to store and transport. The five bags are all the same size at 12 x 14 inches, but they come with different colored bands at the opening. Some users mention that the different colored bands bleed color when first washed, so you need to be careful the first time you wash them. The tare weight is not labeled on the bags. Fabric – For a long time, the most popular options for eco bags were made from organic cotton or calico. Most fabric options are a little more environmentally friendly than plastic ones because they are biodegradable. However, lately, the more popular brands are using reusable plastic materials made from polyester and nylon. Whichever material you choose, most of the different brands are durable, washable, and are a much better option than the one time use, clear plastic bags. Cleaning- When you are using reusable containers that contain food, you need to be careful you are cleaning them properly to avoid any mold or contamination issues. For the most part, the products that we have listed above are incredibly durable and very easy to clean. Generally, these products are washable in a washing machine. Some of them can also be put into a dishwasher to clean, I’m not sure why you would do this, but I guess it is a thing. You can always hand wash if you would like to extend the life of the bags for as long as possible. Almost all of these types of bags should be air dried to avoid shrinkage and wrinkles. Tare weight – If you are concerned about the bags adding extra weight to your purchases, you will want to get a brand that lists the tare weight on them. Tare weight is just the weight of the bag. Depending on where you shop, you should be able to get the tare weight taken off the total weight of the goods that you are buying. If you shop at bulk stores, organic supermarkets and stores, health food shops, or the new zero waste grocery stores that are popping up you will want to check out styles with tare weights, since the staff at these types of stores can deal with it quickly. The tare weight is sometimes listed on color-coded tags or the outside near the opening. Most of the products weigh very little, so they don’t make a huge difference in the cost of what you are buying. Transparency – It is tough to find a reusable option that is transparent in the same way that the clear plastic is. People often worry that the cashier won’t be able to see through the bag and it will add a bit of inconvenience to the cashier. If you are worried about this, you can take one of the stickers from the produce and stick it to the outside of the bag near the opening, or you can leave the bag open with the label or tags clearly showing, so the cashier just has to look in. In my experience doing this over the past year, the cashiers don’t seem bothered about having to look in the bag for the sticker or to see what’s in it. Storing Food– A lot of individuals use these products for storing the food once they have brought it home and put it in the fridge. 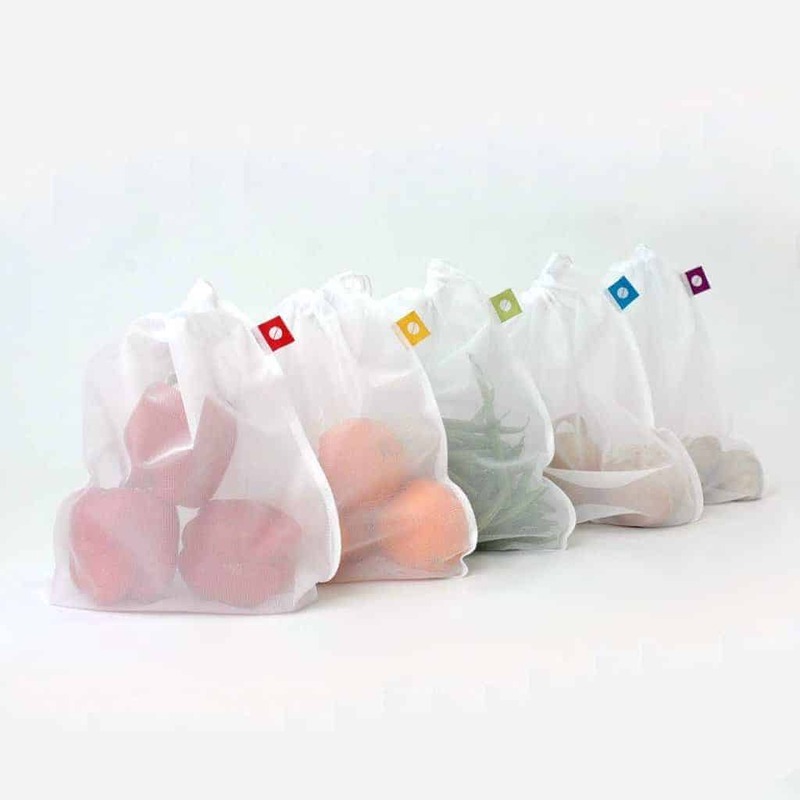 You can keep your produce lasting a bit longer by using eco bags because it allows the fruit or vegetables to breathe, while also keeping it away from other food. It will work for most fruit and veg, but you may want to avoid storing leafy greens in mesh products as they may wilt quicker. Toxin and BPA free-It is always a good idea to make sure any items that you buy that are storing food are BPA free. Most manufacturers know this and are ensuring that the materials are safe and toxin free so they won’t add any extra chemicals into your food sources. Multi-Functional– You don’t need to use these types of products for food storage. People use them for all kind of things like storing small items when traveling, using them for shoes, cosmetics and toiletries, accessories, kids toys, and even taking stuff to the beach. 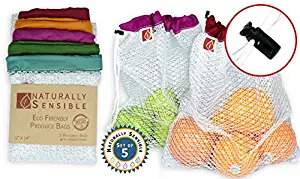 If you have always hated using the terrible for the environment, disposable plastic bags that are offered in grocery stores, you should pick up some reusable produce bags that are easy to use, easy to store and are washable so you can keep everything clean.